One night in the last week of August. Quite a lot of advertisements on newspapers about cheap airtickets made me a bit curious. The last time I flew was in the pre-recession period - back in 2008. I was curious if the fares advertised was all-inclusive or the old trick of announcing only the base fares. I got busy browsing some prominent travel portals. To test how cheap flying could be, I checked tickets for Onam - with a September 05 departure from Bangalore. Bus fares for the same date were in the 1.8~2.6K range. The air fares were in the 2.0~2.4K range! I was a bit surprised, and toyed with the idea of booking a ticket if I could get tickets for my return. I put off the idea and decided to fly two weeks later, and managed to get tickets for Rs. 1430 on an evening departure of SpiceJet to Kochi. Then the hunt for the return ticket began, and managed a cheap ticket on JetKonnect. I left my office in the after lunch. I was taking a bus to the airport for the first time. 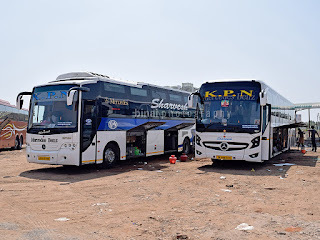 I reached Hebbal Bus stop around 1430hrs - there was more than 2hrs to go for my flight. There was no boards indicating the bus stop for Airport buses at Hebbal - there were people standing around the entrance to the Subway, and I also joined them. 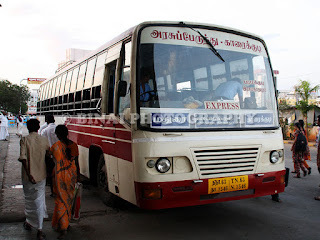 A bus on KIA-9 turned up at around 1445hrs - the bus was almost full. The ticket made my purse lighter by Rs. 180. I initially took a seat in the rear half of the bus - but later shifted to the seat right behind the driver. Unlike the harsh sounds the city Volvos make, this bus sounded very calm and relaxed. The driver was maintaining constant pace on the highway, and used light signals before lane changes. I was dropped at the airport by around 1505hrs - my flight was close to 2 hours away now! I made a visit to Subway before entering the terminal. The security guys at the entrance gave me a weird face when I walked in at 1530 for a 1655hrs flight! I had checked in through the website the previous night and hence directly proceeded to security check. Being in an airport after a good 6 years, I was a bit confused about the procedure. Security check was quick and I was in the waiting area by around 1600hrs. As I walked into the terminal, I noticed that my flight's departure gate had already been announced - and the gate was at the lower level. After a quick visit to the washroom, I headed towards the assigned gate (gate 6 IIRC). The boarding gate was already open, and boarding was on - I joined the queue, and got into the bus that was waiting to ferry us to the aircraft. It was a Cobus3000 doing the honours. About 15 minutes was spent in filling the bus itself - we were dropped near the aircraft at 1635hrs. It was VT-SPK "Fennel" doing the honours for this trip - a Boeing 737-800 commissioned in 2006. Since my seat was closer to the rear exit, I headed straight to the rear gate. The ground agent welcome with a warm smile, cut out the counterfoil of my boarding pass and let me into the aircraft. The first thing that caught my attention was the tight seating - there was absolutely no leg space. The seating was perfect for a maximum flying time of an hour. It was just impossible for anyone on the window seat or the middle seat to get to the gangway without the others in the row getting off their seats. We were having 100% loads, and it looked like most of them were flying for the first time. Boarding completed in about 5 minutes, and the aircraft was pushed back at 1650hrs. We started the taxi roll soon afterwards. There were 4 attendant - 1 female and 3 male. All of them wore T-shirts and a denim pant. Even as the safety demonstration commenced, many passengers were busy taking group photos and selfies - the crew had a tough time asking passengers to settle down. We did not have to queue up, and we directly put on the runway. We took off at 1656hrs - perfectly on time. The aircraft climbed quite steep. The seatbelt sign was switched off in about 10 minutes and the in-flight service began. I had a nice sub before takeoff, and hence preferred only a serving of water. The flying time in this sector is too short for elaborate in-flight service. After the service was over, the attendant came for a round of clearing - they collected the trash. This was my first experience in the sector and hence I spent most of the time trying to identifying things I saw below. I could see Coimbatore airport and the umpteen windmills around the Pollachi area. Soon the terrain changed and got greener - hills appeared in sight, and I could see a couple of damns across the horizon. The captain came on line and announced landing at 1722hrs. We were over Kerala by now for sure - since it was green all around. Cochin Airport was visible - The aircraft flew past the airport, and then turned around and aligned for landing. It took about 10 minutes from the time the Airport was first spotted to Landing. We finally touched down at 1743hrs. As soon as the aircraft vacated the runway, passengers were busy getting off their seats and collecting their overhead baggage. 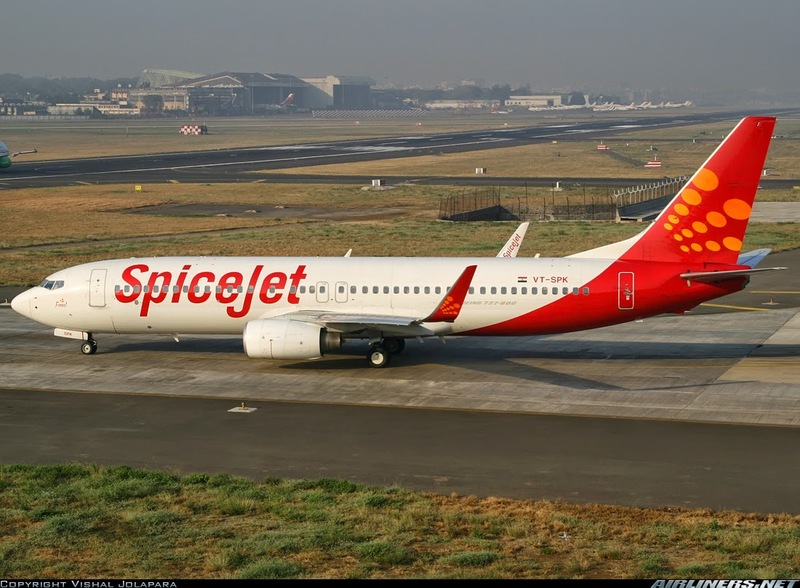 The captain announced our before-time arrival and gave away information about outside temperature and thanked all passengers for flying SpiceJet. The gangway had a long queue and was crowded by the time the aircraft arrived at the terminal. I remained in my seat till most of the crowd got off. I was out of the airport by 1755 - all thanks to having only hand baggage. 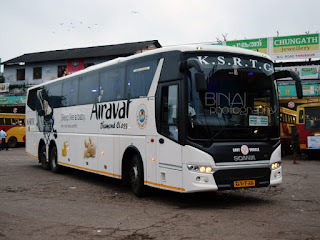 A KSRTC Volvo parked right outside the arrival terminal took me to Aluva later. I was at home by 1930hrs! Long back Air Deccan had introduced a lot of Indians to flying - the fare war that followed bled almost all the airlines, and some of them do not exist anymore. But the breed of LCC which were born then still fly, and SpiceJet is one of them. This was my second flight with Spice Jet - and I truly enjoyed it. With Flights getting cheaper than buses, I wonder why would people want to spend 8-10hrs in a bus, when you can fly down in an hour? With this journey, my preferences slowly moved to flying, and I am busy searching for cheap flights for my upcoming trips as well! Note: I am not an aviation freak - so pardon wrong terms or the too simple writing. A comprehensive well executed review as always, Binai sir. I have traveled by air only 5 times, but love reading about them a lot. I also fall in the vast majority of people who prefer buses to planes even though the prices are comparable sir. I also agree that I have a certain degree of paranoia of flying due to reading a lot about various incidents.